Me? I only grew two legs. But I like my bi-pedalism. Oh sure, it's not as fast as quadri-pedalism, but on a man-made contraption, such a bicycle, I can almost outrun a chasing dog. Some might consider a vintage ‘70s ten-speed steel-framed Raleigh-Schwinn a real clunker, a Studebaker by modern tour-bike standards, sturdy and built to last a thousand years–looked like it belonged in an Egyptian museum–but it was mine, in good enough working order and I had something to prove to my quads and hams. Weeks in advanced preparation, I coached my body, coxed muscles I'd neglected for years, prepared to give . . . well, maybe 92.5% effort, most of that towards turning the pedals. I've never liked the idea of giving 100% to any physical endeavor–paint me superstitious, as well as lazy–I figure I'll need a little some reserve to survive on while I'm getting transported to an ER, if need arise. Toni, a friend I'd met decades ago–hard to imagine–and our maiden “Lolo Holiday Tour” planner, had forewarned me of the course, which I confirmed by Google Earth. 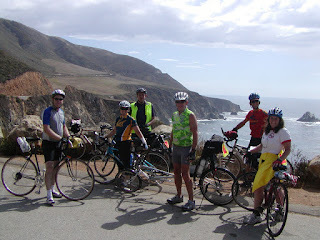 We faced a long slog, with relentless grades at Big Sur . . . not one of my childhood afternoon jaunts, instead, serious as bread mold. My fall-back plan? Throw the white flag and hitch a ride in the “sag” wagon, or beg my wife, Janet, to retrieve me. Ron H., gracious enough to stop at my house on his way to the group rendezvous in San Francisco, had prepared himself to assist me in dissembling my two-wheeled jalopy for crammage into the rental car that he'd picked up that Sunday morning. 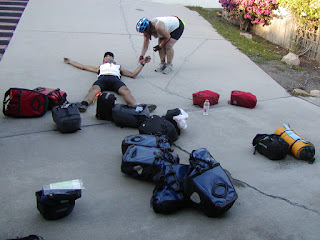 An experienced hand, Ron had been cross-country at least once, and met Toni and the others last year on such a ride. The two of us fiddled with various placement combinations of the pieces of my bike and his, unbolted and unscrewed, including the racks we'd use to accommodate the “pannies,” as Ron called them. Pannies? Too fufu for me . . . the term, not Ron. I'd just as soon call them bike bags or their actual name, panniers. French, no doubt. This jaunt wasn't going to be some ramble down the lane. 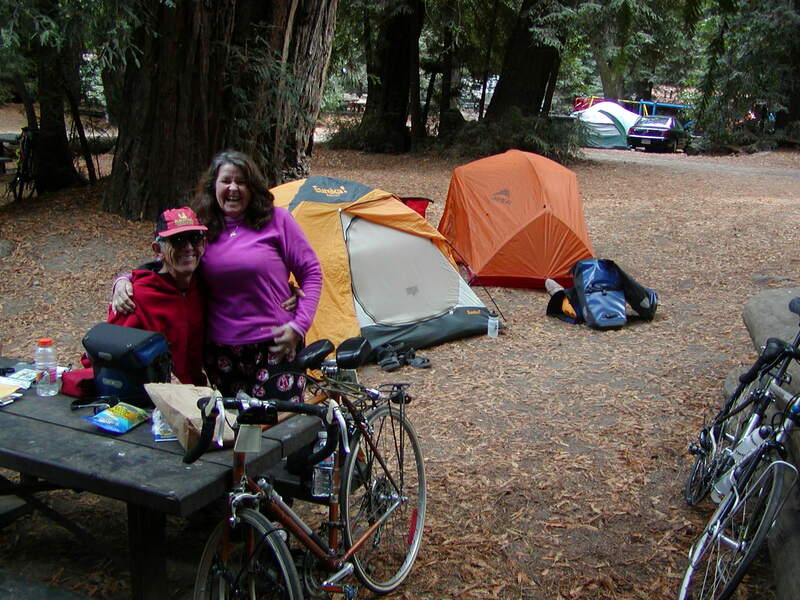 Ron H., Toni, her husband, Wil, and I planned to camp over for one night near Big Sur, so we needed gear. In addition, we'd lose the sag wagon. A righteous haul, bike bags on racks at wheel level, both sides, front and rear, we'd resemble an odd configuration of pumping legs and over-stuffed chipmunk cheeks creeping along the roadside. That evening all the signatories on the summer's Lolo Holiday Tour rendezvoused at a hotel in San Francisco near the Marina and Presidio, and then headed to a Mexican restaurant for dinner and socializing, where I acquainted myself with the other victims, and they with me. 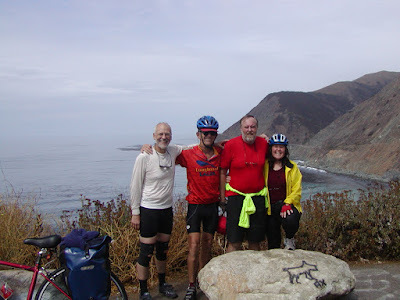 Toni and Wil had met Patrick, Ron H., and Richard & Karla on a Trans America bike trip the year before. Wil’s brother, Ron Sr., and nephew, Ron Jr., and their respective wives, Sheila and Karla, comprised part of the group, as well as Patrick’s girlfriend, Meagan. Marilyn, Wil’s sister, had also joined. I rounded out the cadre as a long time, almost forgotten, friend of Toni and Wil. Stressed, I remained awake all night–my indigestion may have played a small part in that. I worked quietly, so not to disturb the others snoozing in the room we shared, sweat bullets, perused ads in the Yellow Pages for a hardware store, where I could cop a replacement bolt. I'd gotten careless while rebuilding my two-wheeler in the room, and stripped the bolt that secured the saddle. And if I couldn't find an appropriate replacement? I doubted the universal duct-tape solution applied to my particular problem, and didn't want to pursue that option. The morning fresh, Ron H. drove me to a nearby hardware. Voilà, first place, a suitable threaded metal rod, along with matching nut, ready to mount my seat to the frame, all for a mere $.89, plus tax, a meager sum in my mind. 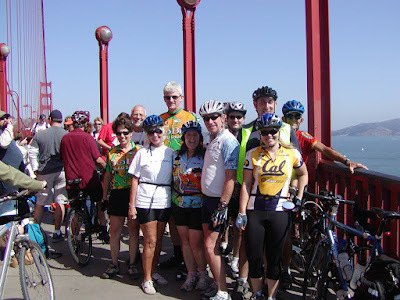 Our bike warm-up from the hotel, across the Golden Gate Bridge, to dry land in Marin County, provided the initial shakedown, opportunity to work out last minute glitches. So far, so good, no major issues. We headed south, paused midway across the Golden Gate for the view, had to, no way around that. So, there we were, in perfect weather, bikes at our sides, respectively, when I commemorated the start of our bi-pedal journey down US Highway1 with a spit into the water for good luck, and hoped my legs could get me the 600 miles to my front door in Santa Barbara. Would I fold like wet cardboard? Would my quads and hams cramp up like salted snails? Would I go lame with a blown knee? Only one way I'd find out. Didn't take long to realize . . . shoulda, woulda, coulda trained harder. 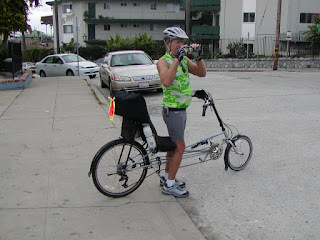 I inched my way through Daly City on our destination to Half Moon Bay, jockeyed for last position in the pack with Toni. “Those two automated traffic speed signs we passed flashed me at 11 and 16 mph,” I bragged to Toni between gasps, “fast enough to get noticed,” then complained about my struggles uphill. “Take your time. This is a tour, not a race,” Toni said. “Keep reminding me,” I replied. I required several rests that first day, but evaded the sag wagon. Second day, right out of Half Moon Bay, the two-lane road narrowed as it wound uphill–a forever stretch of pavement in my universe–which nearly exterminated the shoulder on the right and the white line clung to the pavement only by inches. No margin of safety from the rush hour traffic. Couldn't get any farther to the right, without being in a two-foot ditch. Shouldn't get any farther to the left, except to commit suicide. Most drivers yielded a wide berth and a few honked as they passed. I coasted on the downhill, but used my brakes to maintain a safe speed and prevent a meander to the left, and wilder side of the solid white line. Strong wind afforded us no relief on our third day on the flatter stretch to Moss Landing. A wind, in a hurry to get somewhere else, anywhere, blew with a fury, had no time to spare. Greeted with blasts of dust lifted from the adjacent crop fields, I squinted to reduce dirt in my eyes, breathed slowly, my mouth shut . . . I still tasted grit. Persistent, relentless, steady cold wind, with strong gusts on occasion chilled me and turned my peddle-effort into a tedious, unwelcomed chore. Several times I considered a stop to don more clothes . . . but I too was in a hurry to get somewhere, anywhere, out of that wind. Glad for a lunch break at Moss Landing, I ate, warmed myself and gathered the will to muster on. My confidence increased, my quads and hams learned the routine. I felt more confident I could take one day at a time, maybe one mile at a time, if need be, even one hill or a single curve. On steeper and longer hills, I degenerated to one revolution of the gear at a time, particularly when the road disappeared around a curve and I couldn't gauge when I'd reach the next downhill. Our routine of rising somewhat early, although always at a civilized hour, followed by a relatively leisurely pace, proved favorable to me. Now and then over the flatter terrain, and on gentle downhills, when two or more of us grouped in a single file, we ped, ped, peddled as fast as we could, like frantic-footed ducklings lined up behind mother. Then on the uphills we spread out again, but not by choice. Each day a fresh start–surprised me–I peddled along, clung near the right margin of the roadway, as far and often as possible, and with head bent I looked down, watched that endless solid white line in a hypnotic trance, saw every pebble and stick, scanned my path for any object that could cause a flat tire or spill. Bob and weave, bob and weave, the white line meandered under me to my right and left. I passed an abandoned tennie here, skirted a lone sock there, swerved around nails, broken glass, bent wire, and all forms of discarded trash. I listened for the sounds of approaching vehicles, tried to gauge their distance and speed, as if that would make any difference if one veered towards me. Mincemeat in ten seconds or less, no ifs, ands, or buts, if I'm hit. I considered living and dying a crap shoot . . . possibly a matter of faith, but not something I put a lot of stock in . . . or maybe karma, still a bit of a stretch for me. Wouldn't matter much however I sliced it, getting run over would result in a bad hair day. In Monterey, Ron Jr. fell while making a slow left uphill turn when his chain broke. Augured into some well-placed dirt, avoided pavement and the path of traffic. No serious injury. Ron Sr and Ron Jr., on their recumbent touring bikes, made easy work of the uphills with their twenty-seven gears. Me? My technique of peddling in the standing position improved–a bad deal, if the chain broke–at least, I could compensate for my ten-gear handicap, that way. I dreaded every hill, refused a close study of maps and data. I'd rather not know in advance my expiration date. Those maps deceived us, anyway, made every hill appear like a shear wall, when in fact some were far easier. Seemed to be little rhyme or reason to the deceptions. Except for Toni's comment, “Big Sur has big hills,” said with a straight face, and of which I had no doubt, I figured it better to remain oblivious to the approaching travails. I saw the railroad tracks cross the road diagonally, and the day's damp conditions likely meant water coated the steel and created a slip hazard, so I slowed, angled across at 90 degrees after checking for an on-coming train. Most of the pack followed somewhere behind me. When everyone regrouped down the road, Megan sported a bandage and splint, explained she'd gotten unnerved by an approaching train, skidded on one rail and fell, yet soldiered on with a fractured finger and sprained wrist. Several of us bunched up on a gentle downgrade. A steep slope of several hundred feet down to the ocean on our right allowed distant views of the scenic coastal panorama. Without the biker cardinal rule warning, “Stopping,” Toni came to an abrupt halt. Ron Jr, close behind, swerved to avert a collision, lost his balance and lurched over the edge. 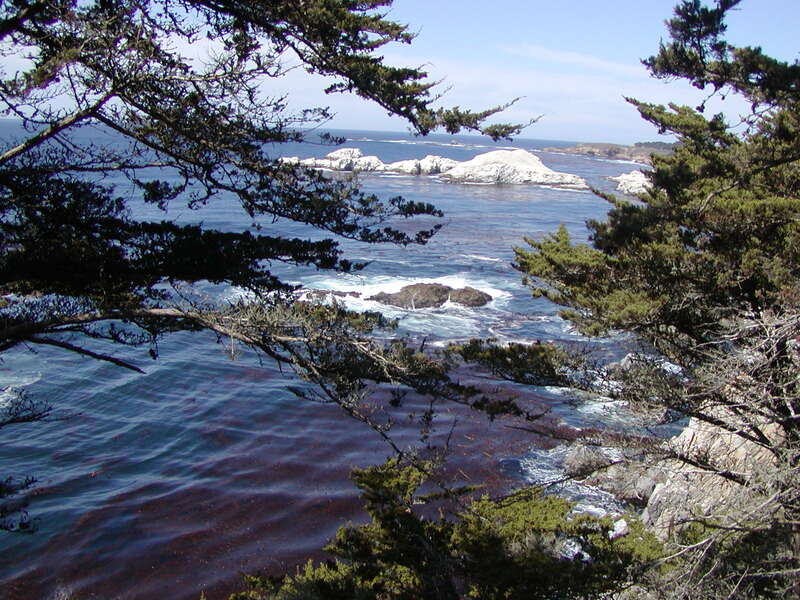 Those of us present watched the few scrub bushes several feet down the steep embankment provide him a slow-motion fall, which prevented his descent into the Pacific Ocean. “Are you okay, Ron?” Toni yelled. “Just a few scratches,” he said as he untangled himself from brush and bike. “I don't know what I would've told your dad, if I'd broke you,” she said. Patrick, Megan, Richard and Karla, Ron Sr. and Ron Jr., and their wives, and Marilyn ended their tour in Big Sur, as planned, about the half-way point between SF to SB. Toni, Wil, Ron H. and I rested the following day at Big Sur, walked a little to remind our leg muscles not to pack up shop and go home. A rain began that evening. I prayed the second part of our journey, sans sag wagon, would be easier than the first. The next morning we rose to wet and cold conditions to break camp. Anticipating a worst-case scenario if I got soaked, I borrowed a heavy, wool shirt from Wil. Nothing worse than cold, wet misery of the bone. I'd learned the dangers of hypothermia the hard way on my Honda 90 some years ago headed north on a long downhill straightaway from Crater Lake in Oregon. Barely able to keep my 90 on the road, violent shaking forced me to pull over and start a fire. Each uphill peddle generated body heat, but on the downhill coasts I shivered in the blast of cold air, and rode my brakes to reduce wind chill. Loose wheel spokes didn't help my cause, either. I feared a face-plant if the front wheel collapsed. At the very least, a bent wheel would generate a big hassle, likely end my trip, so I glanced at both frequently. 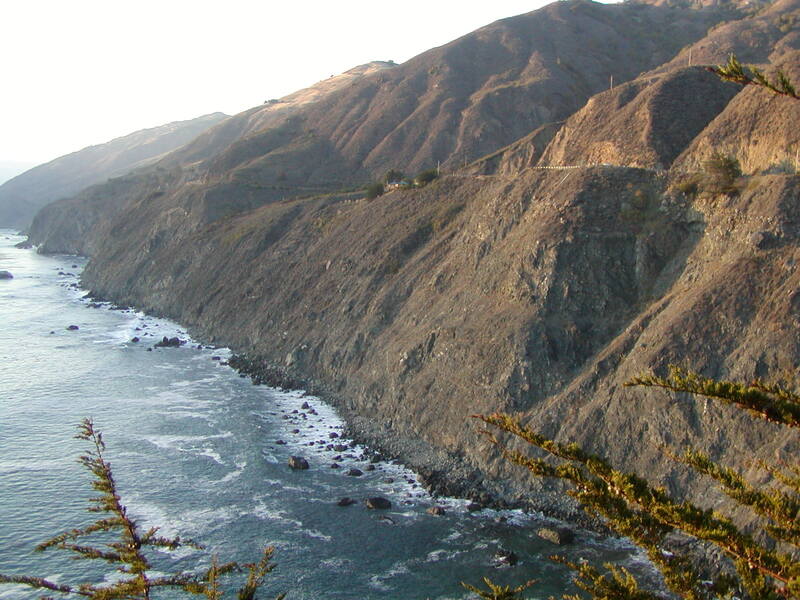 Hadn't discovered that problem until Big Sur. No place for adjustments, not for miles north, not for miles south. By noon the rain stopped, the sun broke through the clouds, my mood improved. The long uphills seemed eternal and the miles dragged by. Without disappointment the stretch of road before and after the “town,” Gorda, met, even exceeded our dread as a long and grueling climb. Gorda? A gas station, small grocery and restaurant, maybe two houses. Built solely to entice passers-by. South of Gorda, and after long downhills, the terrain began to level and I looked forward to San Simeon with hope. We passed Hotel California, aka Hearst Castle, atop the ridge some distance from the beach and road. Moonstone Beach came and went, and then Cambria, followed by Harmony. I called Jack, a longtime friend, inquired if he'd meet me somewhere along our route through Cayucos, explained I wanted to say to say hi, but he wasn't available. We rode to Morro Bay, where Toni understood we were to meet a friend of hers and spend the night. Wrong. Turned out her friend lived in Cayucos. Ron H. bid farewell to Toni, Wil and I, where he'd arranged for a friend to pick him up. The remaining Lolo Holiday Tour contingent, our numbers whittled to three, did the unmentionable, a dreaded backtrack. The next morning Lolo Holiday Tour pulled into San Luis Obispo, stopped at a bike shop for needed repairs, gears adjusted for Toni, spokes tightened for me. Delayed us about three hours, almost a half-day’s ride by our standards, but we got on our way soon enough. We purchased lunch supplies in Guadalupe, sideswiped Orcutt, careened towards Vandenberg Air Force Base. Well away from military canines patrolling the outskirts of the air/space base, a quarter-mile off the road and out of conspicuous sight, we declared a cow pasture our campsite and took particular effort, made easier in full moonlight, to elude the inconsiderately placed cow pies. After our early morning awakening to several half-ton, cud-chewing bovines engaged in a stare fest, we continued onward, rode through Lompoc, with a short stop for a coffee-pastry fix. My coffee, the way I like it, thicker than chicken bouillon but not chewy, slid down well and reinforced my resolve to complete our final day's ride. The road south from Lompoc to Hwy 101 provided challenging extended elevation gains, and in the heat of day proved arduous and draining. Near Hwy 101, after we'd crested the uphill grades, we halted for a needed rest and gawked at a marijuana interdiction operation. Easy to deduce from the sheriff's markings on the helicopter ferrying a load of green stalks nestled in cargo net to trucks clustered on a dirt road. We spotted a news van parked nearby . . . but saw no reporters or cameras. Bummer, no one requested an interview with me. We revitalized ourselves at the Hwy 101 rest stop beyond the Gaviota tunnel. The ride east towards Goleta offered gorgeous views of the ocean to the south while the breeze cooled us and the sun hung in the near cloudless afternoon. Just as the highway narrowed and a sign warned of NO PASSING at the bridge, my inertia challenged by some added drag, a unique sound grabbed my attention, the grind and squeak of a twisting, bending rubber tire made when flat and rolled under a heavy load. No doubt, an innocuous unseen cast-away, part of the detritus spread along the roadway, thrown from a speeding car by a thoughtless individual, created a small hole which sucked the soul out of my rear tube. For the first time, I appreciated the intimacy I'd developed with that unique and narrow environment along the right edge of our thoroughfares. Didn't appreciate my situation . . . nor the slob who'd discarded that little hazard. Took me thirty minutes to remove the back wheel and affect a tube change, a considerable chore, and I thanked myself for the second of the two new tubes I'd lugged with me. I rejoined Wil and Toni a half-mile beyond the bridge, where they'd waited. “We were wondering what happened,” Toni said as I pulled alongside. We veered off Hwy 101 at Hollister Avenue towards downtown Goleta . . . no, more like crept up the off-ramp from 101, only slightly faster than a sedated tortoise. We faced some distance still, but I didn't let on. The uphill on Cliff Drive loomed in my mind, a toil I’d faced numerous times in training, where I'd struggled to reach the crest without total physical disintegration, that last huff-n-puff before the short gasp to my driveway. I didn't tell Toni or Wil about that, either. What would that serve? My countdown began . . . the last hill, the last straightaway, the last stop light, the last turn, the last pull on the pedal . . . the last dismount . . . and I was there at the bottom of my driveway. Off my bike, weak-kneed, my quads and hams screamed. I could barely stand. Toni said, “I didn’t think,” pant, “I would,” gasp, “make it up,” pause, “that last hill,” puff. “Yeah, I figured it better not to tell you about it in advance,” I said. Janet came out the front door, must have heard our noises. I'd forewarned her of our impending arrival. “Hi,” she said, then laughed at our unnecessary self-imposed exhaustion. Our tour mileage had increased each of our eight days apeddling–not so much by prior design but from increased stamina and conditioning, though hard to imagine–sixty-three miles our longest day and fifty miles our average, a genteel engagement by serious bicycler standards. And for the first time, I considered myself a righteous bi-ped. The early hour, along with the jet-lag which gripped me like a vise, conspired to mute my enthusiasm. But I re-stuffed my day pack, and with Hadrian's Wall Path guidebook in hand, legged it the quarter-mile to the ruins of Segedunum Fort, eastern terminus of Hadrian's Wall, under gray overcast. I could've hired a car, or used convenient countryside buses, and rode leisurely to and fro, enjoyed leisurely afternoon teas and a selection of pub draft beer along the length of Hadrian's Wall. Could've accessed “the Wall” from two-lane roads in dozens of places, taken short strolls, studied all the ruins, and arrived at my evening’s lodging with my feet none the worse for wear. But no. Me? I had to hoof Hadrian's Wall Path westward the eighty-four miles from Segedunum (Wallsend, Newcastle) to Maia (Bowness-on-Solway), across undulating northern England. That's just the way I am, wanted the gut-feel for life as a member of the Roman Legion posted here nearly two millennia ago. My guidebook laid out meal and lodge options along the route, even divided the walk into reasonable segments, which fit my time-line to a tee. I'd decided to collect the six stamps on a “Hadrian's Wall Path Summer Passport.” Proving something to somebody? Might help me remember where I'd trod. The Segedunum museum and ruins wouldn't open for several hours and the deadline to complete my eight-day trek and meet Janet, my wife, in Birmingham, pressed on my mind like a case of flu, and I didn't intend to skip one stride along “the path,” so I collected my first stamp at a nearby gas station, an official alternate site. Where? Wallsend, of course, English place names so sensible. Unanswerable questions about the lives of the legions along “the Wall” swirled through my mind, and I imagined a twenty-year old conscript's scribbled message on the monument, Kilroius was here. Westward, ho. 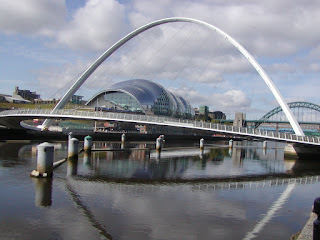 For want of a travel companion, I dragged Kilroius with me as I marched the asphalt path along the Tyne riverbank which meandered through Newcastle. No need for weapons on this trek, Kilroius carried his kit of spare clothes, food rations, a cooking pot, a short spade, a hand mill for grinding corn and two wooden stakes to help build a protective fence, everything hung from a long pole he rested over his left shoulder. I hadn't a clue where we'd find corn for him to grind. 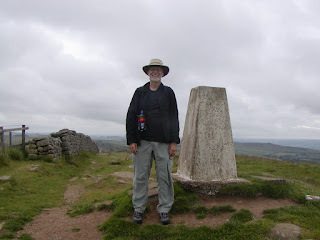 Prepared for the vagaries of foul English weather, my gear included wind and wet-weather clothes, long johns and sweater, bottled water and snacks, a few meds, sun glasses and hat, and guidebook, everything I needed for my trek across this narrowest width of England, east to west. Not sure about Kilroius–who could bivy anywhere, I figured–I planned to eat and sleep my way along the route dotted with hotels, B&Bs and pubs more numerous than the twenty-one forts the Romans had constructed and manned. A thousand paces counted silently, give or take, marked our first mile by legion standards, but hadn't gotten us out of Newcastle, with all its concrete and pavement, glass-windowed buildings, parked cars, coffee bars and pastry shops that didn't befit my idea of Hadrian's Wall or the Roman Empire. 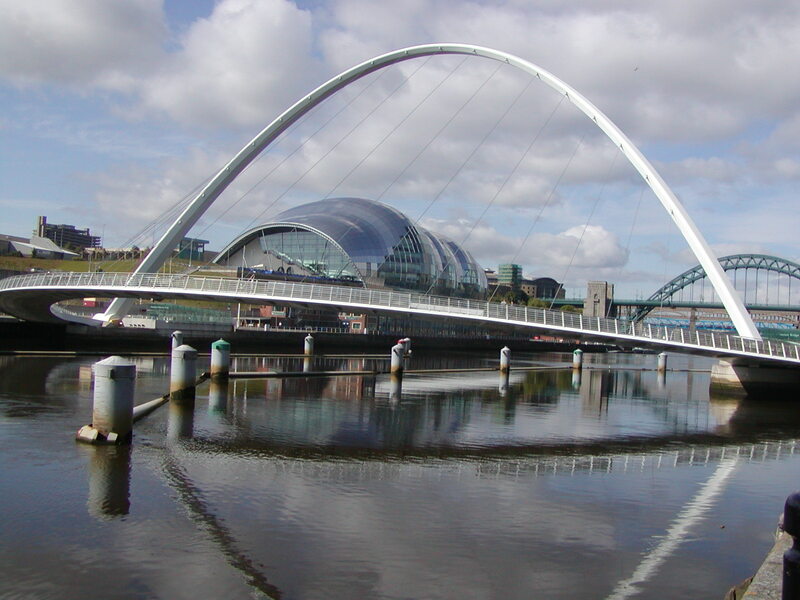 Make no mistake, I enjoyed the seven bridges built over River Tyne. the city's invisible boundary where open fields of green, bordered by trees, reminded me less of this century and replaced by one Kilroius would recognize. 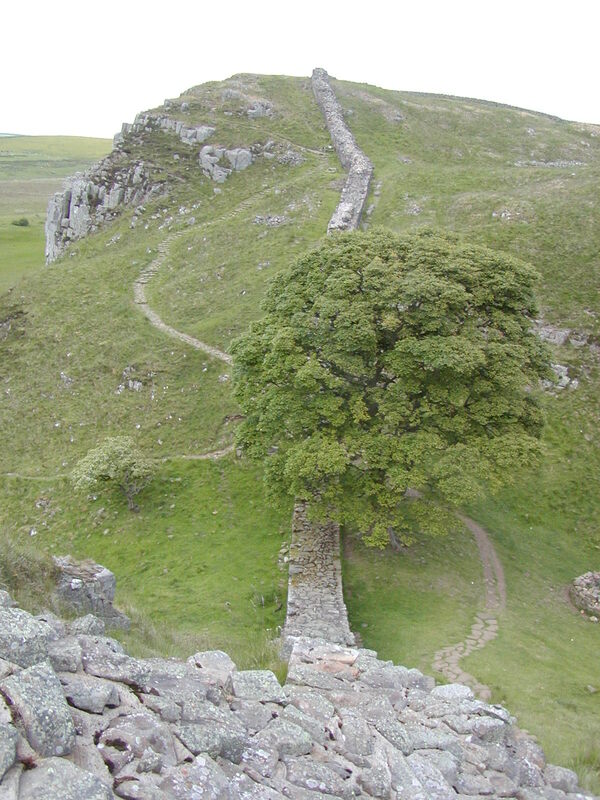 Designated a UNESCO World Heritage Site in 1987 CE, remains of “the Wall,” have been augmented with a hiker's path, which deviates occasionally but follows the remaining structure as closely as demeaned feasible. 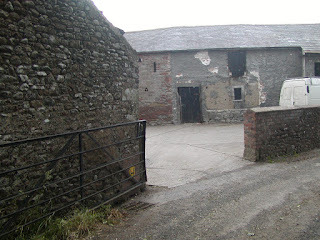 According to plan, I'd stop somewhere near Heddon-On-The-Wall, depending on the accommodation I could wrangle by cell phone, an advantage Kilroius never enjoyed. Near my intended day's destination I couldn't help ogle at a major stone section of “the Wall,” according to my guidebook. I'd made good progress, if my aching feet weren't complete liars, though a cake walk for infantryman Kilroius, I felt sure. A one-mile diversion off the path, I settled on Close House Country Club, one my feet didn't appreciate, but hey. Damn, walking shoes, ill-suited to the task at foot. 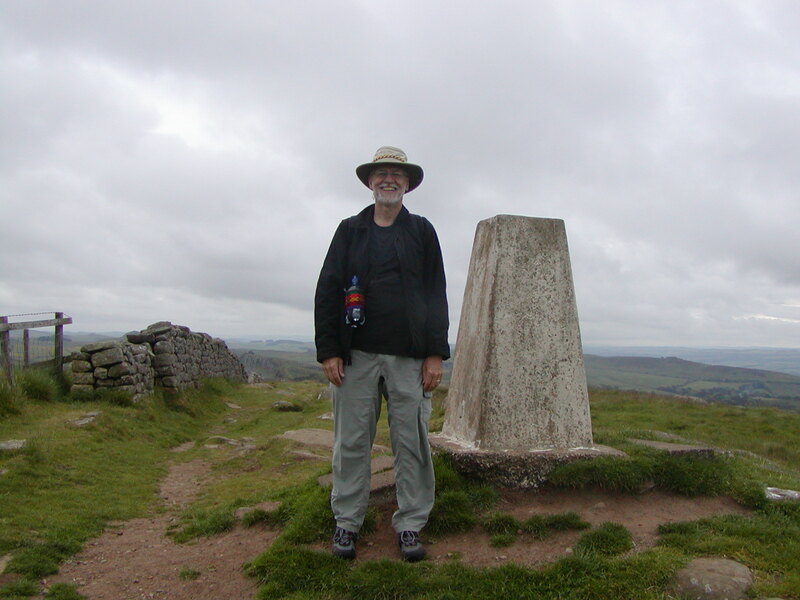 I discovered a plague of small blisters–any number of which could strike down the best walker–populated my feet, while my sore legs provided little encouragement to continue. Kilroius' feet, thickly calloused, I'd bet, from marching in his flat, hobnailed leather sandals, and legs toughened as a Roman infantryman, faired far better. Me and Kilroius hit the trail our second morning, nearly beat the rooster crow. 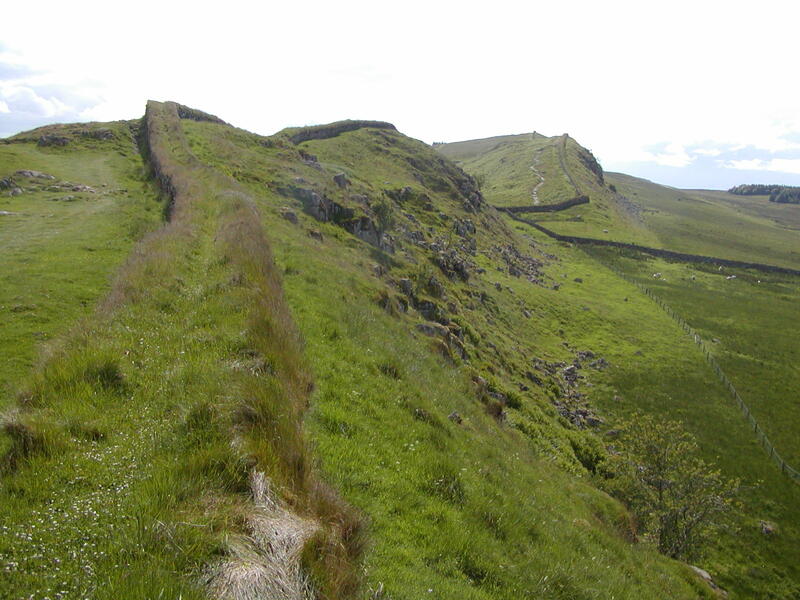 Not long after our start, I noticed signs for “Military Way”–a more recent English application of the term, easily confused with the Roman use as a portion of “the Wall” structure. 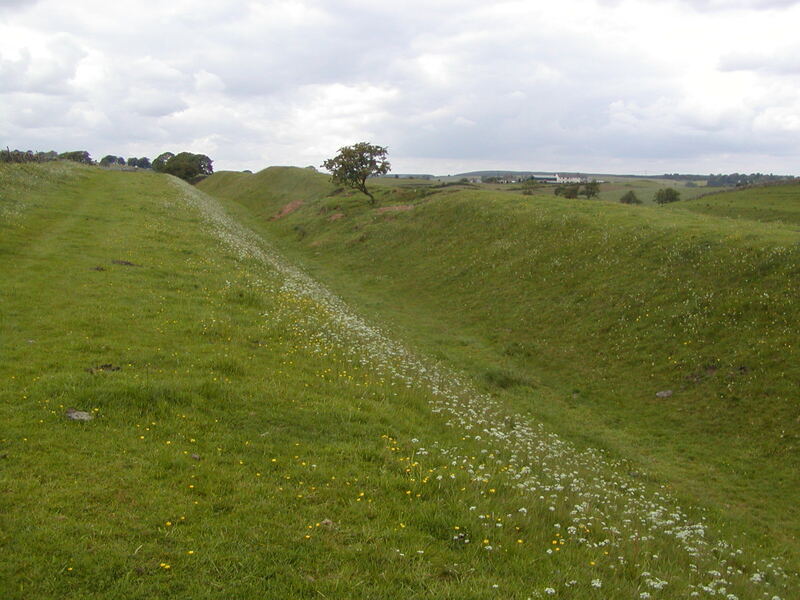 My guidebook, Hadrian's Wall Path, informed me the paved road here overlaid the vallum–a major indignity imposed on “the Wall”–built wide and level to allow quick dispatch of English General Wade's troops to ward off Bonnie Prince Charlie in the 18th century CE. Asphalt pavement layer added later, I presumed. “The Wall,” a composite structure of a stone wall with one ditch to the north, a wide flat area just south of the stone barrier, which the Roman's referred to as “military zone” or “way,” then a raised earthen mound, followed by the vallum, then another ditch, and yet another earthen mound, required major effort to construct. 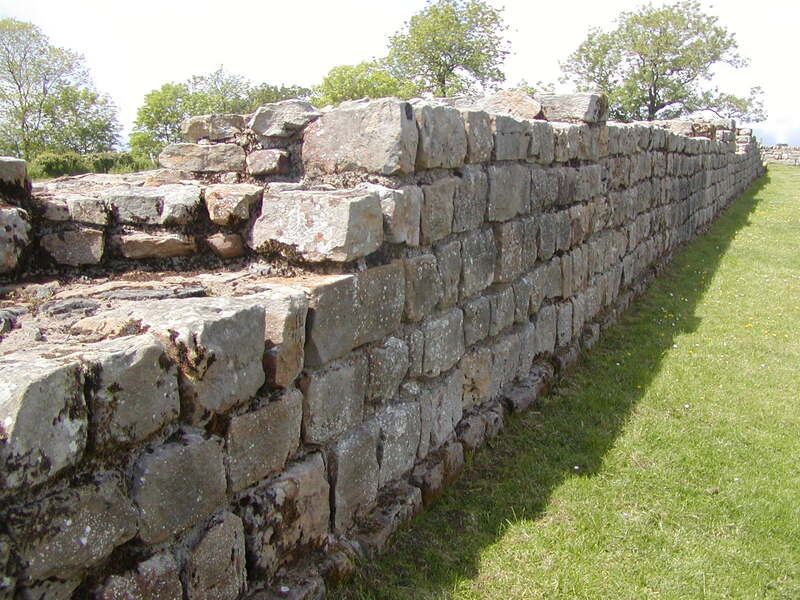 However, “the Wall,” remained a work-in-progress under Roman hands, the matter complicated to no end, with various features constructed, amended or decommissioned at different times, such as the military way and the vallum. In more recent times well-meaning individuals rebuilt sections of the Wall, not necessarily to original specifications. My attempt to understand the nuances of this conglomerated mix of historical facts felt akin to teasing a thread from a hairball. Why had the Roman's expended so much energy on construction of the various features? Sure they weren't fools, I concluded they'd discovered these facets, more than a mere suggestion of defense, created a formidable barrier to fight one's way across, and even impeded deserters. Thwart malcontent Caledonians to the north–who would meld with an infusion of Irish to become the Scots centuries later–from spoiling the otherwise acceptable demeanor of the inhabitants to the south–doing their own melding to become the English. The Romans moved their defensive line northward and southward over several hundred years. Aside from Hadrian's Wall, the similarly constructed Antonine Wall and the more porous Gask Frontier, occupied swaths across present day England and Scotland at different times, until the Romans packed it in and abandoned the British Isles in the fourth century CE. Warfare between the remaining northerners and southerners continued for centuries afterwards. Seems to me, it continues today, although not as vehemently–the independent minded Caledonians difficult to deal with on any account, before and after Kilroius came and went. When I crested a long, gentle hill, I spotted a concession-caravan parked aside the road and amidst a partially-mowed grassy knoll. A lawn mower sat idle nearby, conspicuous and ready to continue its work at a moment's notice. A total surprise, didn't take long for me to realize a hot breakfast awaited me for only a few shillings–another example of English civility. Done deal. I'd left Close House with an empty stomach and plan to forage food somehow, somewhere. At Robin Hood Inn, right aside the path, I collected my second stamp, while across the adjacent road a foraging mob of free-range chickens pillaged the local insect population. 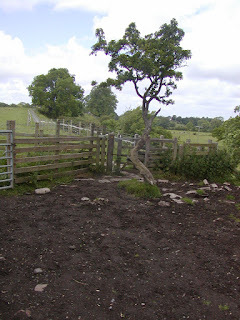 Stone stiles, kissing gates, and wooden stairs along the path marked transitions from one field or property to the next, discouraged uninvited four-legged grazers from indiscriminate sampling of pastures, and provided a change of pace. 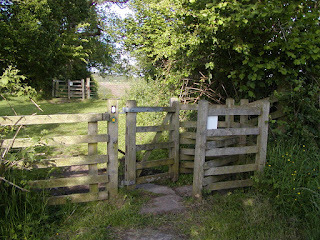 Ten kissing gates controlled the path around one small farm. 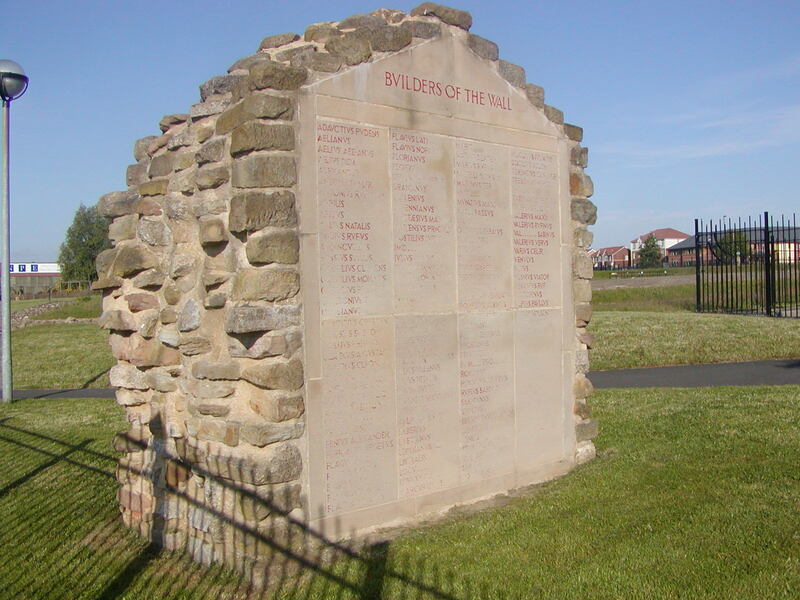 Not far beyond, I passed through Halton Shields at deliberate speed–what had inspired that name?– then encountered a well-preserved section of vallum. If only the entire Wall path were so straight, level and easy to travel? The earthen works of Hadrian’s Wall lay altered by natural erosion, farmers' plows and hooves of herd animals, not so much from contempt but the expediency of cultivation and grazing. Past Halton, and the remains of another Roman Fort, the path deviated down a stretch of paved road oblivious to the Wall. That or most of the Wall's features laid waste, abused and altered beyond recognition. A combination of both, I suspected. The terrain near level, the path reunited with River Tyne and led me towards Dilston Mill, past small clusters of trees, my sense of English countryside. Then came Hexham. The history of buildings, the place names and the undulating landscape, encouraged a wallow in endless questions. What had happened here? Since Kilroius? Before him? But I continued to move–my final destination beckoned–while I contented myself with snippets of information from my guidebook. Leaving Acomb, I kept an eye peeled for the “bull in the field,” as the guidebook warned, but didn't spot a menacing male bovine, while I utilized the smallest space possible and moved along with purpose, intent on avoiding an incorrect impression of permanent residence. Step-by-step across rolling countryside my fascination for the Wall's complexity increased, as well as my appreciation of the associated history created by generation after generation of inhabitants who'd farmed, hunted, traded, and squabbled over who could do what, and to whom. All along its length locals re-purposed “the Wall's” stones for churches and pasture fencing, many specimens originally quarried and dragged into place, some in excess of one-ton. 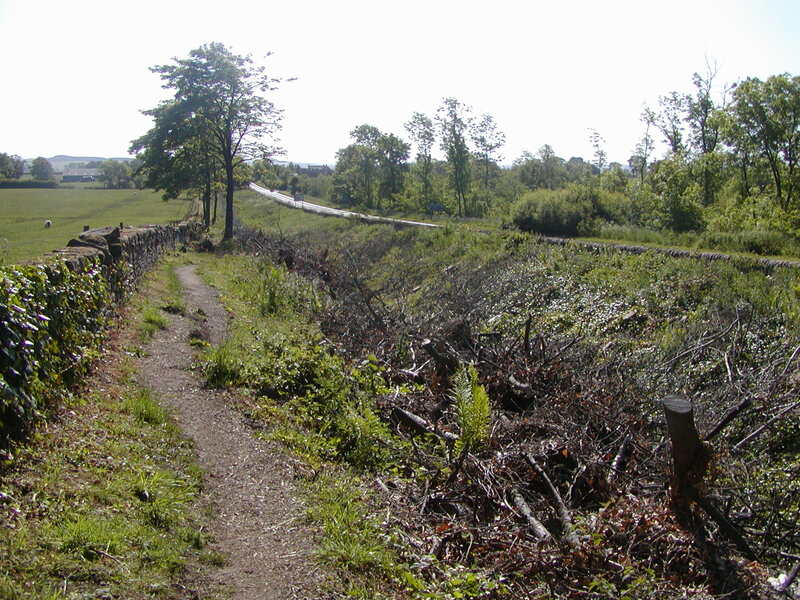 At best, the stone wall, generally 15’ high and 9’ wide, lay ignored and neglected as a coherent and organized defensive line after the legions departed, and at worst, endured plunder and other indignities, which to some degree continues today as walkers tramp atop selected sections. Every thousand paces a mile-castle housed about 30 soldiers, and in between stood two equidistant turrets (observation posts) occupied by ten troops each. Twenty-one larger forts, constructed in strategic locations, garrisoned larger numbers. In some cases, fort locations pre-dated the Wall, some located well south of it. Signals moved along the Wall by sight, messages at horse speed, Kilroius as fast as his feet could carry him. At one time Roman forces increased from a measly 3,000 soldiers to an intimidating 15,000. 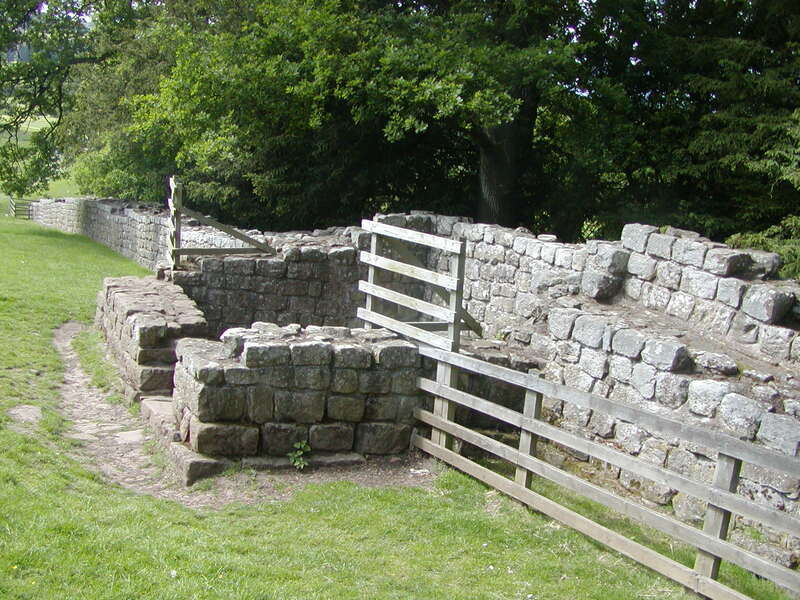 To their credit Roman troops defended the Wall with only a relatively few intrusions. A significant breach occurred near the end of the 2nd century CE, and thus, a major rebuild commenced during the reign of Emperor Severus. Add more stones and cement them with lime. engineering . . . paved roads, hot baths, indoor plumbing. after the legions marched off in 409 CE. Surely, the Romans considered holding this frontier as secondary to the defense of other territories on the continent, even more so their homeland, per their partial garrison withdrawals in 197, 296, and 367 CE respectively. Woodlands scattered over the countryside, the many fields and properties lined with trees and hedges, and the open grassy fields that abound, populated with itinerant cattle and sheep, encourage the eye to wallow in green-bath luxury. 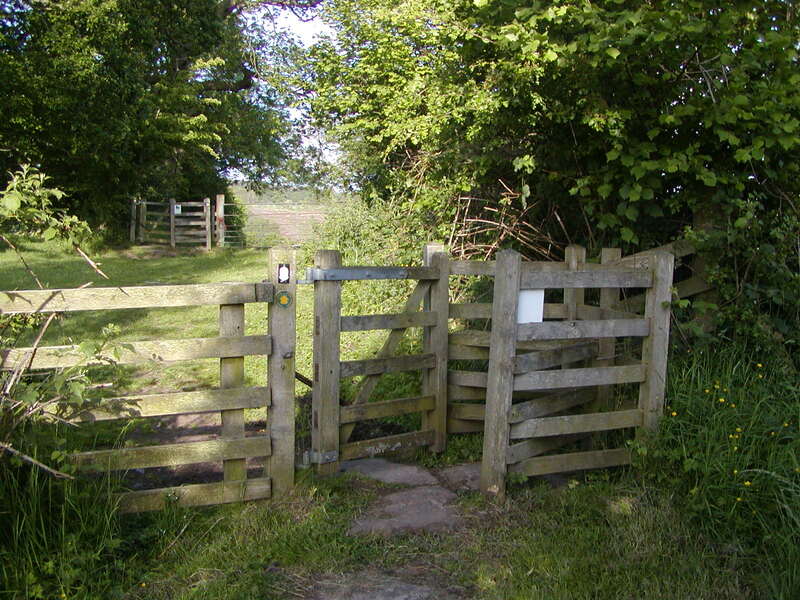 Footpaths cross the countryside, many well worn and long established as public rights-of-way, while signposts guide walkers at junctions with roads and other footpaths. In many places Kilroius and I found our way by following strips of mowed grass aside and through the fields, while minding cow and sheep dip. 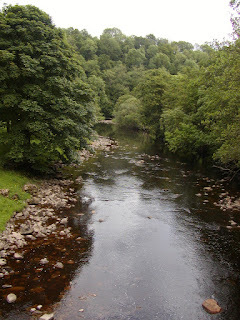 I'd had enough walking, and tired and hungry, while my feet bitched and screamed for relief from a second day of pounding, I set sights on Chollerford and secured a bed at the Swallow George on the north bank of River North Tyne. Settled into my room, I eased off shoes and socks, and discovered my blisters, as if in conspiracy, had merged into one on the bottoms of both heels. I'd never before suffered ones of that size. Little surprise though, in hindsight, I'd gotten a constant stream of disturbing messages all day. Third morning, I hobbled onward, tried to wish my ailments away, and collected my third stamp at Chesters, not far from my start. The landscape opened to distant views, trees, less frequent, hid in wind protected spots along the way, while green hills stretched into the distant view–moorlands, the English call them. 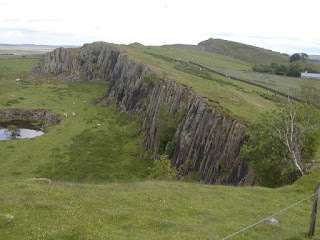 Periodic north-facing crags, more frequent, formed a gentle arc on their trajectory westward while the Wall followed the high ground, which afforded unimpeded views towards the Scottish border to the north, while chill-wind hurried south over English countryside. No northern ditch here, geography used to best advantage. The Sewingshields Turret plaque provided detailed information about original turret construction. Built atop of the stone wall every three-hundred Roman paces, one hundred-sixty-one “observation towers” lined the defensive structure, their ground-level stones removed long ago, perhaps their wooden second-levels as well, which just as easily may have rotted away or been burned by disgruntled Caledonians. occupied some turrets after the Romans withdrew? I couldn't know for sure and Kilroius remained quiet. As a result of the various human activities the remaining original stone structure of “the Wall” lies primarily in the hilly mid- section of England, where the earthen works and foundations of mile-castles and turrets remain in fine example, if only in fragments, and provide a glimpse of the Wall's grandeur and engineering marvel. Easy for me to spot the lone white building across the moorland, some two miles away, down hill, away from the path and on the paved road used by occasional traffic. My guidebook pointed me towards Twice Brewed Inn in Once Brewed–where did people come up with these names?– since my first steps earlier that morning and I certainly didn't want to cuddle with Kilroius in the open air through a frosted night–the thought of the large expanse of moorland to the north under gray overcast, provided me no comfort, left me feeling alone and wanting the warmth of my wife, Janet. 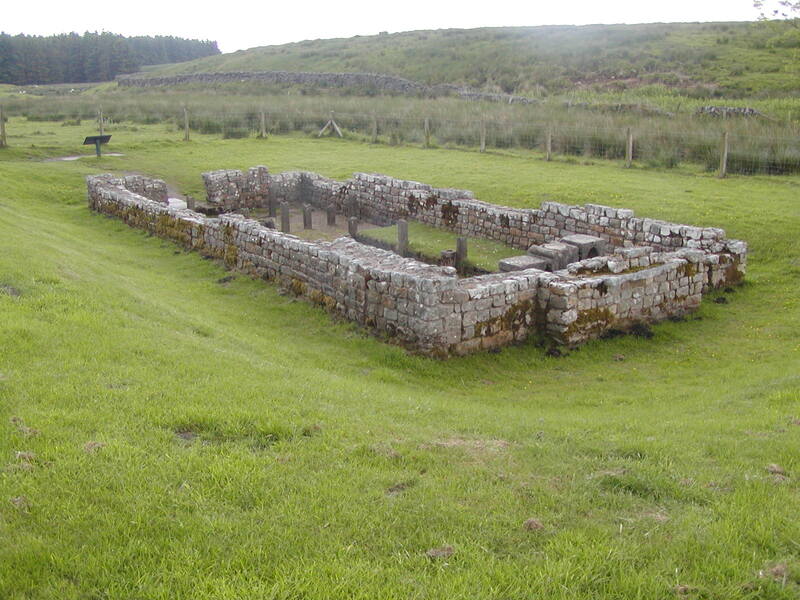 Like I had in 'Nam, I'd bet Kilroius, hot-footed to his local Roman version of a cat house to get some strange–his pay burning a hole in his tunic, doubtless–his earnings as a conscript too meager to maintain a wife. Sycamore Gap proved interesting. A tree, tucked into the low point next to a gate in the Wall, held a solitary vigil. How old was that tree? There when Kilroius helped lay stones in the Wall? Most likely not, but I liked the idea it might've been, anyway. Its gnarled branches spread to a wide green canopy softened the bleak isolation. At the closest point possible, I veered south, away from the path and down slope on a narrow paved road towards my best bet for a dry bed, warm meal and pint of Guinness within miles. Twice Brewed fulfilled my expectations. I made no complaints, thankful for the accommodations. 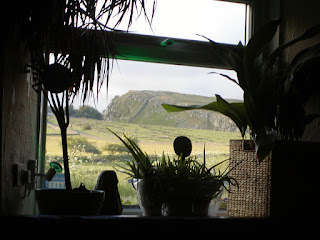 A cooked meal and glass of brew hit the spot, while my feet throbbed and I looked through a pub window at the pass where I'd labored only shortly before. My fourth day, I struck out for Walton, some 17 miles distance, engaged in a personal survival march. Gray sky and brisk wind suggested more unpleasant weather on the way and the heels of my soles, each possessed by one blister larger than a silver dollar, burned when pressed. I doubted Kilroius ever complained, if he even had blisters. A generous application of tape, my only remedy, did little to ease my suffering, but I'd limp along, my final goal stationary and waiting. Back on the path I soon reached an obelisk, the highest point along the Wall. The cool breeze encouraged me to move on after I persuaded an east bound walker to commemorate my presence with a photo. Total BS, I knew, but I needed a psych boost. The trail descended, then ascended again over more crags, my knees in serious battle with gravity. Beyond Caw Gap, I passed the last example westward, according to my guidebook, of narrow Wall on broad foundations, which continued to run along the south side of north-facing crags. 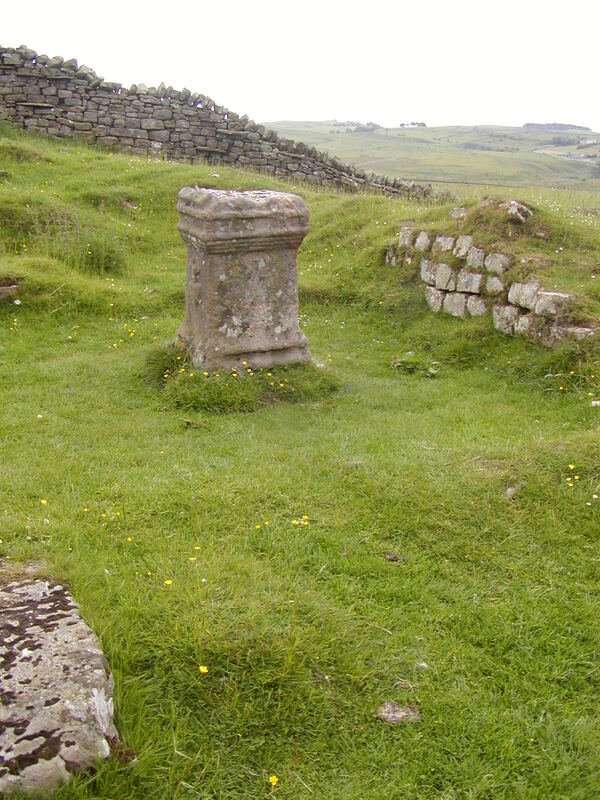 My guidebook's promise of an alter at Great Chesters Fort, a structure Kilroius would've called Aesica, swayed me to stop for a perusal. Underwhelmed, I had to admit some two-thousand years wouldn't be kind to any stone exposed to the elements and I hoped I'd look so good after that length of time. Off the trail to the north at one-hundred yards I spotted some dozen plus young, shoulder-high recruits, huddled not-so-intently with plywood shields–only somewhat at the ready–as a male tutor worked to inspire them on as future members of Roman legion. Several other adults stood watch nearby. Their level of enthusiasm, or near complete lack of, suggested conscription. I related, figured Kilroius did too. The path led me along a well-preserved stretch of ditch with adjacent earth mound, past a two-story stone structure with arrow-defense slits turned latter-day-barn, through Gilsland where the path skirted a lush garden, attended to as I passed, by the owner I presumed, and then early industrial revolution bridge, each a different layer of English conglomerated history and accommodation. Near Willowford, a modern bridge, the low point of the Wall path for me today, traversed the Irthing River. The black water appeared knee deep as close as I could gauge–I wasn't of a mind to wade in–hardly a river by many standards, more like a creek. But who was I to judge? I hadn't done more than shuffle pebbles along the path here. The Wall's connecting point when built, or close to that, construction approached from both ends, Bowness-On-Solway (Maia) to the west, and Newcastle-Upon-Tyne (Segedunum) to the east. Accustomed to places listed with several names, I accepted that English history lay piled in deep deposits everywhere, like crusted sediment. Past some invisible half-way point, and aware of my progress achieved in spite of my infirmities, I collected my fourth stamp at Birdoswald. Onward, a self-help snack-shop, several steps off the path, offered edibles. 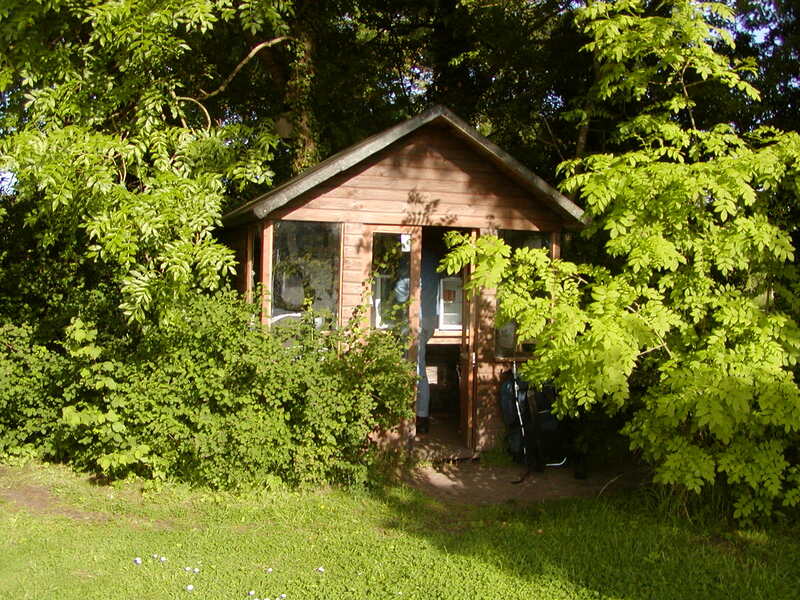 A prefab, over-grown playhouse–excellent shelter from foul weather, if I'd needed it–provided cookies, slices of cakes, bags of chips which lay spread over a small table, and accompanied by a sign with prices and request, Leave the appropriate money in the basket. How novel? An enterprise based on the honor system. Before I moved on I added the price of one cookie to the till. Walton, a tiny village sprawled over a hill amidst the rich-green of English summer, appeared from several miles away. The last quarter-mile of gentle grade up the narrow two-lane road didn't appeal to me, but bound for the Centurion Inn, I had no recourse. Spent, I paused my journey at the traditional country inn and pub which overlooked rolling landscape to the south, as well as to the east from whence I'd hobbled that day. My blisters, grown slightly since their last physical exam that morning, ached, though appeared otherwise stabilized by the tape that had covered them. Made curious by split, twisted exposed wood beams not barely eight feet above the floor, and walls slightly out of vertical and nothing at a true right angle–gravity having it's way and the building sagging from age–“How old is this pub?” I asked, when the owner served me my meal order. “You could've enjoyed your meal here during George III's reign,” he said. As I examined the tidy, brightly-painted room, furnished in a more modern décor, Now that's real history for you. I'd learned about the American Revolution in school, albeit the American version sans details of George. Kilroius reminded me that history here stretched back ten-times farther as I pictured him prepare a bivouac shelter and eat his evening gruel. How much farther back could history be traced here? Stonehenge's silent watch spans beyond four millennia. and pressed on my enthusiasm. worked to distinguish mud from manure. Up side? Fresher air, brighter colors. more payola. Had a habit formed? Scant evidence of the Wall testified to man's more recent busy work. The guidebook noted a straight stretch where hikers were, “Walking on the wall or least on the line of it.” Within a short distance the path, continuing straight, followed a paved road, before a veer to the south down a puddled, mud track through a farm. One tree in full yellow-bloom amidst the greenery, and the cessation of drizzle, reminded me the sun would return. Had Kilroius ever felt subdued by bad weather? No way of knowing, but I'd bet he had. Stag Inn lifted my spirits, offered a rest out of the breeze, if I chose. But I preferred to “get it over with” for the day, so continued on. Beyond Crosby-On-Eden, splashes of red and yellow blossoms crowded along the path as I neared my diversion to the Wallfoot Hotel. About ten minutes away from the Wall, an eternity for my feet, the middle-19th century architecture and atmosphere provided a welcomed change of pace, another dose of the varied, rich history I'd hoped to encounter. Blisters drained of fluid from the day's demands, the detached, dead skin that covered my heels, threatened to peel away and expose the pink, ill-prepared tissue underneath. A well night's rest and shower–Kilroius never had it so good–I faced my sixth morning with fresh resolve, even with two handicapped feet. Heels re-taped, I favored the balls of my feet, but traveling tippy-toe failed to alleviate my misery, though helped minimize the pain. With the rain gone, though the sky overcast, bare ground offered firmer footing. Distant views obscured by clusters of trees and signs of human activity, the Wall path led to and from River Eden, until nearer Carlisle where it crossed and clung to the south bank. My feet demanded a deserved break, and warranted by sufficient progress, I stopped at Sands Sports Center Cafe for my fifth stamp and a snack with a plan to avoid any further rest delays for the day. Another stone-arched railway bridge, built long after Kilroius' presence and unused now, reminded me of a Roman aqueduct. Along the riverbank, uphill and away, then downhill and back again, my pace slowed. With long looks at St. Michael's, the Burgh-By-Sands village church, I couldn't help think the Wall had provided many stones for its construction, even a gravestone or two within its walled grounds. I limped into the Rosemount B&B at glacial speed, and like I walked on hot coals. No dinner served there, I gingerly eased my way towards the local pub/restaurant, the Greyhound Inn, where I encountered a statue of Edward I erected just shy of my goal. “Hammer of the Scots,” read the inscription–one bad dude, Edward went after them with a vengeance–“died near here on 7 July 1307.” That said it all, more proof of the continued bad blood between northerners and southerners. Kilroius not cutting it verbally, quite most of the time, I struck up conversation with two fellow Wall walkers, Herman and Marian. Turned out Herman, Danish, I think, planned to write about the Wall with Marian's assistance. My blisters mentioned at one point–commiseration of infirmities a part of fellow walkers' rituals–Herman offered a “special” salve to help toughen my heels. Although a little late, or perhaps a little early, for my present condition, but not one to reject a gift horse, I accepted his offering. Couldn't hurt, I reasoned. Little had changed during the night, and on my seventh morning, the loose-flap remnants of my blisters lay plastered against my heels with band-aids and tape, while the tender tissue screamed bloody murder. Yet I crept along, not much faster than a three-legged tortoise. Spurred on by my shortest day hike, the terminus otherwise within easy reach, and my adjustment to the on-going pain–strange as it was–encouraged my attitude to tough it out. My legs, adjusted to the routine, faired better. Partial cloud-cover offered hope, warm sun better than chill wind. 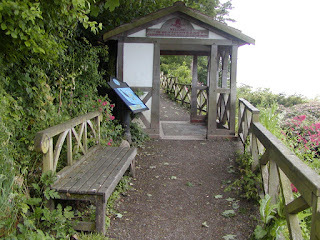 A short distance downhill, the path leveled and once again followed the River Eden south bank, which at some imperceptible point turned to estuary. I watched a dozen cows wad yards into the shallow water from shoreline as I passed. Seemed they didn't give a sot one way or the other who called it what. Between the stands of trees, a curved shoreline in a widening bay appeared and disappeared as I progressed. My journey's end lay somewhere out there, beyond the edge of my ability to discern. Where the path followed a paved road that skirted wave-sloshed mudflats, high-tide schedules posted on boards reassured me I wouldn't get swamped by in-coming water. Easy to envision an extreme high tide, or waves driven by strong winds, overrun the road. Near the Hope & Anchor Inn at Port Carlisle, I traced the last stretch of shoreline to the hill opposite me. No sign of the Wall here, no need for it, the estuary and mudflats sufficient deterrent against anything on foot. “Wallsend 84 miles,” and “Good luck go with you,” the sign above the covered shelter at the western terminus read. After a few deep breaths, I collected the sixth and last stamp in my Hadrian's Wall Path passport, looked back down the path and recounted my journey, then bid farewell to Kilroius and limped the few steps to the closest bus stop to re-enter the 21st century.